Regular expressions (”regex’s” for short) are sets of symbols and syntactic elements used to match patterns of text and they are pretty powerful. 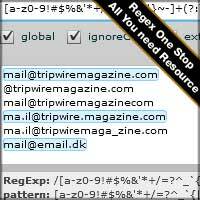 Regular expressions have been around for a very long time (in computer industry scale) and was first introduced as part of the powerful UNIX search tool grep. I believe mastering at least the most basic elements of regex is essential for any programmer. Further I know that having direct access to references, examples, ready to use patterns etc. is essential to speed up your work. This is a toolbox for getting started and/or becoming more serious about regex. It provides details on commonly needed regexs that you can just pick up and use right away. Lets get started!